For 25 years, the Vestavia Hills Rotary Club has been supporting the math and debate teams – as well as the Interact Club – at Vestavia Hills’ middle and high schools with an annual fundraiser. Iron City Chef, patterned after the TV show, pits chefs from local restaurants against each other. Chefs in the past have come from restaurants such as Little Savannah, Ross Bridge, Bistro V and Satterfield’s, among others, though the 2015 competition shifted to pit cooks in local firehouses against each other. “These dollars that we raise through Iron City Chef are put toward our community and around the world,” Iron City Chef Chair Kent Howard said. The money not only supports Vestavia academic teams, but also the VHHS Interact Club, a culinary/hospitality scholarship for Jefferson State Community College, the Vestavia Hills Rotary Foundation and mission efforts to build schools and wells in Africa. The original format of the fundraiser was a roast, and not the kind you do to a chicken. The club would pick a notable local figure and roast them Comedy Central-style. Howard recalled poking fun at Bo Jackson, Paul Finebaum and other local legends. “The roast kind of phased out and we went on to this format,” Howard said. Since the change seven years ago, Howard said the event has been a sell-out every year – with help from Western Supermarkets, Jefferson State Community College and WVTM 13 – and consistently has met fundraising goals. Members of the club also forge a close personal relationship with the teams. Whenever a tournament is held at the high school, a member of the club is invited to help present awards. Looking forward, Howard said that plans already are being made for next year’s event. “We had a great response from our local fire departments, so we are looking for some creative ways to pick our chefs for this next year,” Howard said. The club has set the 2016 competition for July 23, although it hasn’t settled on the chefs yet. So, how do the math and debate teams use the money they get from the Rotary Club? According to Vestavia Hills High School Math Team coach Todd Taylor, the bulk of the money doled out to his team goes toward travel expenses and tournament registrations. In addition to booking buses, tournament costs can range from $6 to $10 per participant. For a competition in Georgia that allows 12 team members to compete, that’s not a huge budgetary issue. But for Texas competitions to which the entire 60-plus student team travels, it gets a bit expensive. 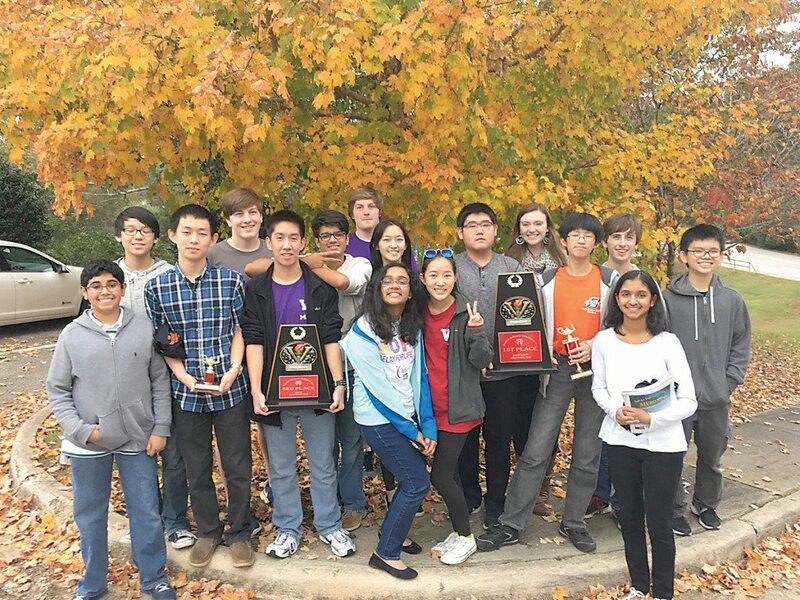 In a regular year, the math team will compete in 12 or so big tournaments. Of those, about two are in state, two are hosted at VHHS and up to seven are out-of-state. Taylor said some out-of-state competitions don’t require travel; students simply take a test and the coach sends them off to the host school to be graded. On Dec. 5, the team hosted a tournament at VHHS that consisted of 51 teams involving about 1,700 participants. Students on the math team generally have been in training since about the sixth grade. In addition to regular math class, team members meet twice a day, 45 minutes in the morning and 20 minutes during the day, to train for competitions. All of that training has led to a year already filled with successes. In October, the team competed in the Oklahoma state test. “They changed their format this year, so they didn’t name an overall school champion. But based on the individual results, we would have been second using their old system,” Taylor said. The team has also traveled to three tournaments in Georgia – with the help of the Rotary donations. There the junior varsity team received two first-place awards and earned second place overall in a competition. The varsity team took second, third and fifth places in one of the tournaments. Four weeks ago, the team traveled to Tallahassee and won second place overall in a tournament.